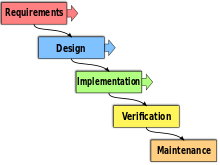 In rapid application development, structured techniques and prototyping are especially used to define users' requirements and to design the final system. The development process starts with the development of preliminary data models and business process models using structured techniques. In the next stage, requirements are verified using prototyping, eventually to refine the data and process models. These stages are repeated iteratively; further development results in "a combined business requirements and technical design statement to be used for constructing new systems. After each phase is finished, it proceeds to the next one. Reviews may occur before moving to the next phase which allows for the possibility of changes (which may involve a formal change control process). Reviews may also be employed to ensure that the phase is indeed complete. ; the phase completion criteria are often referred to as a "gate" that the project must pass through to move to the next phase. Waterfall discourages revisiting and revising any prior phase once it's complete. This "inflexibility" in a pure Waterfall model has been a source of criticism by supporters of other more "flexible" models. The Waterfall model is also commonly taught with the mnemonic A Dance in the Dark Every Monday, representing Analysis, Design, Implementation, Testing, Documentation and Execution, and Maintenance. 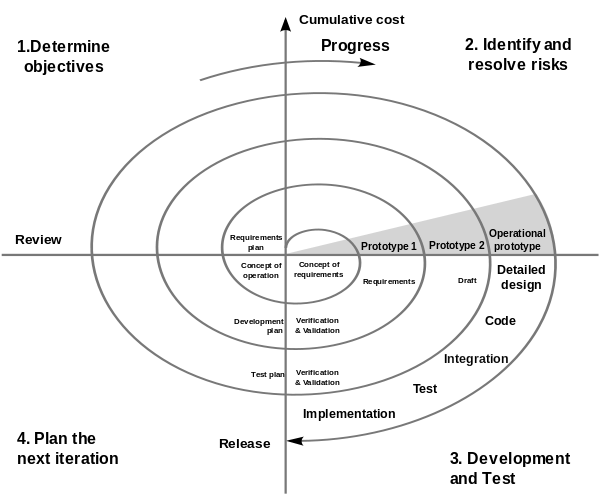 The key characteristic of a Spiral model is risk management at regular stages in the development cycle. Spiral model is a combination of some key aspect of the waterfall model and rapid prototyping methodologies. The spiral model emphasizes risk analysis, and thus requires customers to accept this analysis and act on it. This requires both trust in the developer as well as the willingness to spend more to fix the issues, which is the reason why this model is often used for large-scale internal software development. If the implementation of risk analysis will greatly affect the profits of the project, the spiral model should not be used. Software developers have to actively look for possible risks, and analyze it accurately for the spiral model to work. The first stage is to formulate a plan to achieve the objectives with these constraints, and then strive to find and remove all potential risks through careful analysis and, if necessary, by constructing a prototype. If some risks can not be ruled out, the customer has to decide whether to terminate the project or to ignore the risks and continue anyway. Finally, the results are evaluated and the design of the next phase begins.